Brandon Reed began his Public Safety Career in 1999 as a member of the Middlefield Volunteer Fire Department. In 2002 he joined the Middlefield Village Police Department as a part-time Public Safety Dispatcher and served under Police Chiefs; Easton, Stehlik, and Samec. Brandon started his career with the Geauga County Sheriff’s Office in May 2004 as a full-time Communications Officer. During his time in this position, he served as an “Officer in charge” (OIC) and as a “Communications Training Officer” (CTO). Over his career with the Sheriff’s Office, Brandon has attended numerous trainings in the Public Safety Communications Field. Some of those trainings include; Fire Communications, Customer Service, Domestic Violence, Stress Management, Managing Crisis Callers, 9-1-1 Liability, Critical Incident Dispatching, Active Shooter Incidents, Hostage Negotiations, Advanced Law Enforcement Dispatching, and Protecting Law Enforcement Responders. In October of 2011 Brandon was promoted to the rank of Communications Sergeant (Shift Supervisor). 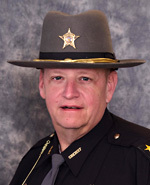 He was later promoted to Lieutenant in June of 2014 and currently serves as a member of the Sheriff’s Administrative Staff as the Communications Division Commander. In this role Brandon oversees the day to day operations of the Sheriff’s Emergency Communications Center which consists of three Communications Sergeants, fourteen full-time Communications Officers, and five part-time Communications Officers. Lt. Reed is a member of the Association of Public Safety Communications Officials (APCO) and the Buckeye State Sheriff’s Association (BSSA). Lt. Reed has attended a number of Management and Leadership Skill Development courses where topics included; leadership assessment, leadership styles, situational & transformational leadership, supervision challenges in multi-generational environments, team building, leading change, problem solving, and building organizational ethic. He is a fan of all sports and enjoys spending time with his family and being active in the community. He is a proud graduate of Cardinal High School in Middlefield and is a lifelong resident of Geauga County. Brandon and his wife Nina reside in Parkman Twp. with their two children. Brandon believes to be a good leader you must first be a good follower. His core values include integrity & accountability and he firmly believes that careers in public safety are more than just jobs, they are professions.